To spice things up for the upcoming 0.3 release of IfcOpenShell, I have just committed a test suite to the repository. The tests use Blender to automatically render images of whatever IFC files I could find on the Internet. A selection of these cases you see parading in the image below. Truth be told, these are the ones that behave nicely with IfcOpenShell. Luckily, by now this holds for a rather large majority, but there are still some quirks that need to be addressed before the 0.3 release. 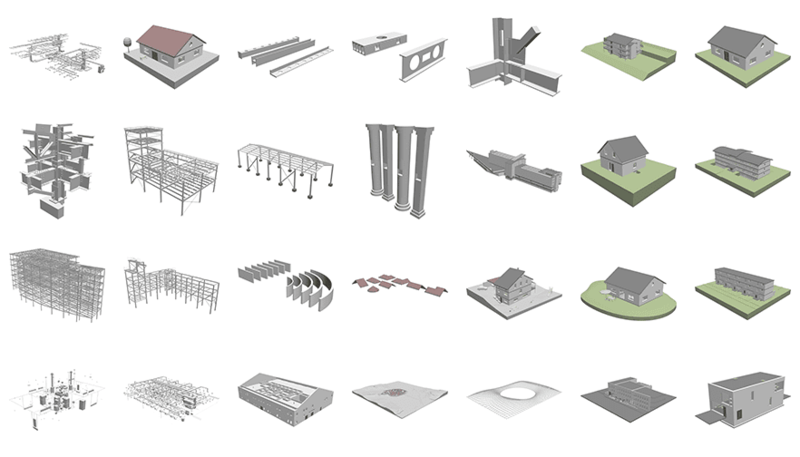 Special thanks go out to Ryan Schultz (studiowikitecture.com, openingdesign.com) and Jon Mirtschin (geometrygym.com) for kindly including their models in our test case suite. If you have some IFC models laying around that you would like to donate for inclusion in the test suite, you can send them to models@ifcopenshell.org. There is some benefit in doing this for you too: we will do our very best the files submitted to us are always rendered correctly. Stay posted for the 0.3 release of IfcOpenShell. Among other things it will feature quite a nice increase in performance!